On the surface, Fulla Abdul-Jabbar seems like any other young Argonne researcher. She is eager to learn, deftly navigates laboratory spaces and speaks passionately about her work. On the surface, Fulla Abdul-Jabbar seems like any other young Argonne researcher. She is eager to learn, deftly navigates laboratory spaces and speaks passionately about her work. But one major detail sets her apart from her colleagues — she is 21 years old and has only worked at Argonne for a brief 10 weeks. But one major detail sets her apart from her colleagues — she is 21 years old and has only worked at Argonne for a brief 10 weeks. 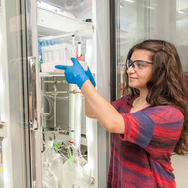 Abdul-Jabbar is one of 76 participants in the U.S. Department of Energy’s (DOE) Summer Undergraduate Laboratory Internships (SULI) program at Argonne. Through the program, students who are pursuing or have just completed an undergraduate degree are able to conduct research at one of 17 DOE national laboratories. Abdul-Jabbar came to Argonne from the University of Michigan, where she received her degree in biochemistry this past spring. She was born in Iraq during the First Persian Gulf War and immigrated to the United States from Jordan with her family at the age of five. Growing up in a suburb of Detroit, Abdul-Jabbar found herself drawn to science as early as elementary school. In college, Abdul-Jabbar researched various topics, ranging from the chemical ecology of milkweed roots’ defense mechanisms to the synthesis of antibiotics that can treat tuberculosis. In between working at an enzymology lab during school, she spent a summer doing drug design research. ​“During that experience I realized, ​‘this is for me.’ I enjoy applying chemistry in creative ways to things that people care about, such as human health,” she said. At Argonne, Abdul-Jabbar has been able to pursue her interest in applied biochemistry. She works with Argonne Distinguished Fellow Andrzej Joachimiak, whose team seeks to improve techniques for determining protein structures, particularly those involved in pathogens that affect humans. Their research informs our understanding of how to combat microbial diseases, and they frequently collaborate on drug design with pharmaceutical and biotechnology organizations. Along the structure determination pipeline, Abdul-Jabbar focuses on protein expression, purification and crystallization. Her goal is to find crystals that crystallographers can analyze to infer the structure of proteins. From these structures, she and her colleagues try to interpret the proteins’ functions. Abdul-Jabbar’s work entails harvesting a large, pure amount of a targeted protein, testing it under conditions that induce crystallization and screening the samples for crystals. If she finds a crystal, X-ray crystallographers at Argonne’s Structural Biology Center can use X-ray diffraction to observe the arrangement of atoms in the sample. During her brief time at Argonne, Abdul-Jabbar has already found three crystals that have led to the identification of new bacterial protein structures. Two of these are the first structures to be determined in an organism called Slackia heliotrinireducins; the other structure belongs to Spirosoma linguale. These proteins are part of the DOE’s Genomic Encyclopedia of Bacteria and Archaea project, which aims to sequence the genomes of species far out on the tree of life. After her internship, Abdul-Jabbar wants to flesh out her research interests before committing to graduate school. In addition to biochemistry, she is interested in biotechnology and synthetic biology. Argonne National Laboratory seeks solutions to pressing national problems in science and technology. The nation’s first national laboratory, Argonne conducts leading-edge basic and applied scientific research in virtually every scientific discipline. Argonne researchers work closely with researchers from hundreds of companies, universities, and federal, state and municipal agencies to help them solve their specific problems, advance America’s scientific leadership and prepare the nation for a better future. With employees from more than 60 nations, Argonne is managed by UChicago Argonne, LLC for the U.S. Department of Energy​’s Office of Science.